Hundreds of criminals have been hanged in Pennsylvania, but only one man has ever lost his life on the scaffold behind the historic Pike County Courthouse in Milford. In some ways this is a remarkable fact, considering that the cupola-topped red brick courthouse has stood at the corner of Broad and High streets since 1873. Yet the county's first-- and only-- execution wouldn't occur until twenty-four years after the last brick had been laid into place. In fact, the whole story of Herman Schultz and his execution is remarkable; he was initially cleared of any wrongdoing in the death of his wife, and he may have lived to a ripe old age had it not been for his two sons, who ultimately sent him to the gallows in December of 1897. Herman Paul Schultz arrived in this country sometime in the 1870s, and took for his wife a lovely young woman named Lizzie Kiefer. They settled in New York City, sharing the same dream of freedom and prosperity that had lured countless other German immigrants away from their homeland to America's shining shores. While Lizzie raised the couple's three boys, Herman worked his way up the ladder of success, eventually managing a chain of tailoring shops in New York. But, on the home front, the Schultz's American dream was rapidly becoming a nightmare; their marriage was marred by frequent quarrels and separations. 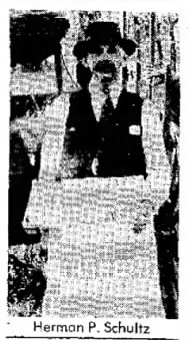 After a fire destroyed Schultz's shop on Spring Street, he found work as a bartender. In July of 1896 Lizzie made up her mind to leave for good. 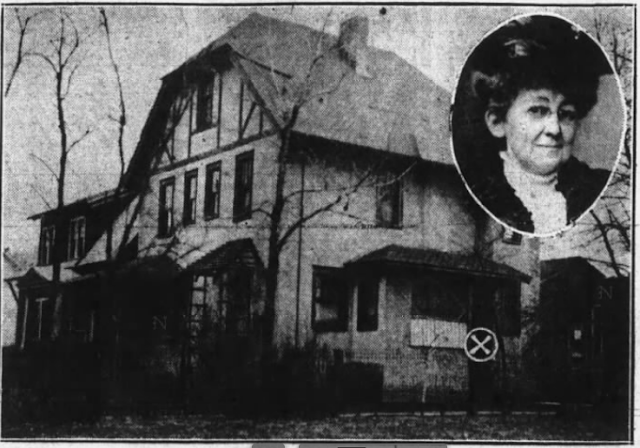 She went to Shohola, taking the children with her, and found employment under the alias of Lydia Smith as a housekeeper at the High Point House, an inn owned by John Wohlfardt. 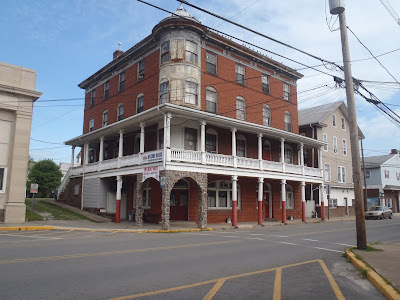 On September 18, 1896, Herman took a trip to Shohola and spent Sunday night at High Point House where his estranged wife was living. By all accounts it appeared that the couple had reconciled their differences. According to Mrs. Wohlfardt, the woman she knew only as "Mrs. Smith" had told her that she was a widow. But after Herman's sudden appearance, she told the mistress of the house that Herman was expecting to inherit a large fortune from a relative in Germany and that they were going to New York to get married. Mrs. Wohlfardt described the couple as being deeply affectionate toward each other. At around nine o'clock that evening, Lizzie sent her twelve-year-old son Charles to bed in an adjoining room, and she and Herman stayed up late talking. Around midnight, however, Mrs. Wohlfardt was awakened by a loud bang. Thinking that the cat had knocked over some cooking utensils in the kitchen downstairs she went back to sleep. When Lizzie Schultz, alias "Lydia Smith", failed to show up for breakfast on Monday morning, Mrs. Wohlfardt sent another servant, Mrs. Haas, upstairs to fetch her. Mrs. Haas knocked on the door, but there was no answer. As she turned toward the stair Mrs. Haas heard a man's voice, screaming, "Oh my God! Lizzie is shot!" Mrs. Wohlfardt raced up the stairs and burst into the room, where she discovered Lizzie's body. There was a bullet hole in her right temple, and Herman's revolver in her hand. When Coroner Geiger arrived at the scene, he scoffed at the notion of suicide; he placed Herman Schultz under arrest. Some interesting and outlandish revelations were unearthed at the inquest. Charles, the twelve-year-old son, admitted that Herman Schultz was his father and that his parents had been married for nineteen years. Herman had beaten Lizzie numerous times, and was a frequent inmate at Blackwell's Island as a result. Herman, however, insisted that he had slept through the shot that had killed his wife. He also claimed that Lizzie was chronically unfaithful, and even produced an affidavit with her signature admitting this fact. He also produced letters, purportedly written by Lizzie, that he had received during their separation. In these letters Lizzie begged Herman to come back and promised that she would change her evil, cheating ways. The coroner's jury concluded that Lizzie Schultz came to her death from a gunshot at the hand of some unknown person. Herman was released from jail and beat a hasty retreat back to New York, only to find the police waiting for him-- his own son had turned him in for arson. On Tuesday afternoon, September 22, Lizzie's body was buried in Shohola. But, if the allegations of abuse presented at the inquest were the work of a young boy's imagination, Charles was just getting warmed up. Herman's twelve-year-old son came out with a sensational accusation against his father, which led to Herman's arrest. "My father was a tailor," began a statement written by Charles Schultz, "and he opened a store on Spring Street. Some time later the place was set on fire, and he collected $500 insurance. After that, on account of trouble with the neighbors, he moved to 14th Street and opened another store. His business prospered so that after a time he took the whole building and insured his stock for $2,000. "One night a strange man slept in the store and father, who always allowed the fire to go out at night, saw that it was kept burning on that occasion. Well, we all had to run for our lives, and when I was going out I saw father dash a jar containing liquid on the floor, which immediately blazed up. He did not get all his insurance, however, so he moved back to Spring Street and, after a time, to 411 West 26th Street. Charles also claimed that, three years earlier, he saw his brother Willie carrying gallons of benzine and turpentine into the store. He then watched his father sprinkle the liquid on the floor. Later that night, the building burned to the ground. "My mother's life was insured at the time for $1,000 and I believe part of his plan was to burn her up with the store," he stated. After Schultz had been arraigned and remanded into custody, he told a New York reporter that his arrest had been the result of his son's spite. "He has always been a bad boy," said Herman, "and has given me a heap of trouble up to the present time." These new allegations from Charles Schultz, along with mounting public pressure, convinced Pike County authorities to take another look at Lizzie's death. He was indicted, tried and convicted of first degree murder. On July 20, 1897, he was sentenced to death by hanging. "My last wish and desire on this earth is that the skull of my wife, which I believe is in the possession of Dr. Wenner of this town, shall be placed with my dead body in one and the same coffin coffin and shall get buried together." Schultz's dying wish was never granted, however. 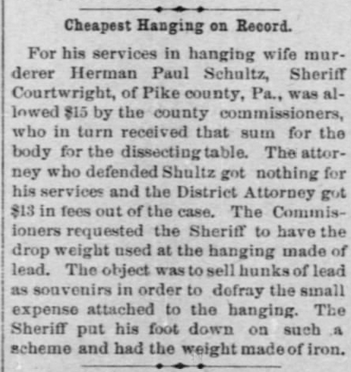 Not only was the hanging of Herman Schultz the first execution in Pike County history, but it also made headlines for being the cheapest hanging in the history of the United States, costing the county a grand total of $13, all of which went to the prosecutor. The additional $15 allocated by county commissioners for the execution was recovered after they sold Schultz's body to the medical school at the University of Pennsylvania for the same amount. They saved money further by "borrowing" a scaffold from adjacent Sullivan County in New York. As for the rope used to hang Schultz, the sheriff paid for that out of his own pocket.